VHF Laneway Tour — another great success! DH and I got into the car yesterday, which is a treat in itself as we usually use transit to get around. But there was not a minute to waste if we wanted to get through all 6 homes in the Vancouver Heritage Foundation Laneway House Tour. Three years ago, it was the Laneway House Tour we took with our designer, Laurel, that showed us some of th4e features we wanted to incorporate into our lanehouse design. Two years ago our house-in-progress was part of the tour, a great honour for us. Now that laneway homes are becoming more and more common, it was interesting to see how the designs are being interpreted across the city, finding solutions to how to keep families together and even how to save a beloved tree. The first home on the tour was not, strictly speaking, one of this generation of laneway homes. Instead it was a strata-title home tucked behind a heritage house in Point Grey. In 1988, architect Robert Lemon purchased the Barber Residence, built in the art deco style by Ross Lort in 1936. The home straddled the front part of two lots, and Lemon wanted to make sure that the home would not be torn down to take advantage of the land. So with a plan, patience, and perseverance, he convinced the city permit department to let him build a complementary home behind his, and to let him enter into a strata ownership with its inhabitants. At 2340 square feet the home is a spacious one bedroom and den, and those two-storey-high windows bring light and an upstairs view into what could be a rather dark north-facing home. Skylights upstairs also lighten the interior. The decor and artwork are stunning, too. Comfortable but elegant, a perfect partner to the Barbour Residence. But there was no sense in mooning about what could never be (for us, anyway), on to the rest of the homes. We zipped up to House 4, just off King Edward Avenue and Columbia. 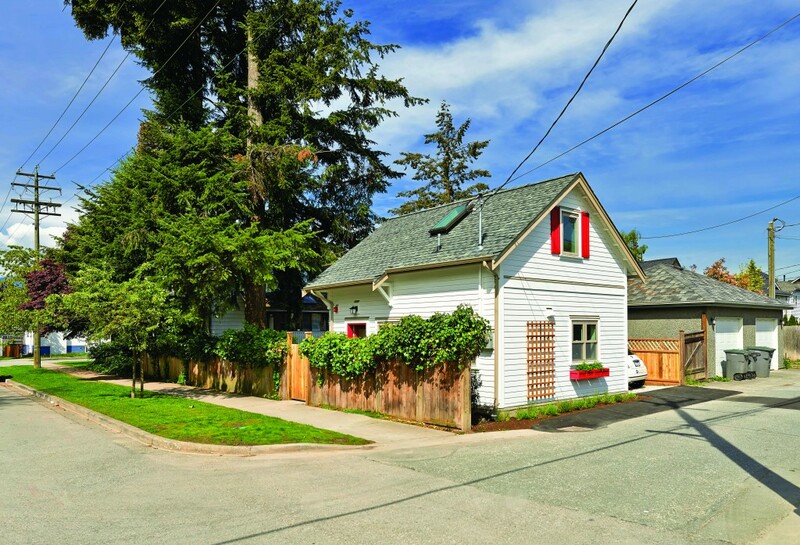 Built on a 150′ by 50′ lot, this was the largest of the laneways we saw, 1000 square feet. There was a nice kitchen and sitting area, but the home is used as a vacation rental, with 3 bedrooms and two baths, so it didn’t say “homey” as much as “convenient”. The take-away from this home was the heating/cooling system — a heat pump. You get heating and cooling with the same system, and it costs much less to run, but costs much more to install. It’s an adorable one-bedroom cottage, all on one level with lovely high ceilings in the kitchen/sitting area. That rounded front door is repeated in an interior hall archway. The house is a reverse plan like ours, with the kitchen/sitting area up top and the bedroom in the lower level. So what did we take away from the tour? All the homes were well-built, and most had radiant floor heat with boilers instead of water tanks. So new home technology is being used freely in these new builds. I’m sure all are energy efficient, and all make the most of the natural light available to them through windows and skylights. We met some new builders on the tour, so you have lots of choice when it comes to pick your own you’ll have dozens of options. And the tour showed us that laneways are a solution, not just for Vancouver’s housing shortage, but for all kinds of problems that people have. A way to keep families together, to let children stay in the neighbourhoods they grew up in and to raise their own children there. Posted in Laneway House and tagged Lane Home, Lane house, Laneway House, Vancouver Heritage Foundation Laneway House Tour. Bookmark the permalink. Three years ago, DH and I and our designer, Laurel, took the Vancouver Heritage Foundation’s Laneway House Tour. It wasn’t the first time we’d been inside a laneway home — we’d seen a couple of examples — but it was a real eye-opener as to the esthetics of the different builders. Plus it showed us that we didn’t have to be bound by old-fashioned designs and expectations — we could truly have what we wanted in our home. Two years ago, our unfinished laneway was part of the Tour — a real honour for us. Unfortunately we weren’t able to make the tour last year — but we’ve been looking forward to seeing what the VHF have in store for 2015. This year those hard working people at the Vancouver Heritage Foundation promise fabulous examples of new laneway homes, showing a wide variety of design. Plus you can also see an infill home that was added to the property of a heritage home on the west side of the city over 20 years ago. This tour is not just for people planning to build a laneway, it’s interesting for everyone who loves good design. But it’s invaluable if you are looking for ideas to incorporate into your home. We had never seen a small window set into the backsplash between a counter and the upper shelves in the kitchen before we took the tour. But we’ve got one now, and it makes the kitchen much brighter. We loved the way open staircases allowed you to see onto the stairs and the lower storey — so our designer put that into our home. After seeing how bright the upper floors were on the two-storey homes, we confirmed our wish to put our bedroom in the darker ground floor level. Get your tickets now! You won’t be able to get into those tasty homes without a valid ticket. This is a tough tour to do by transit, if you want to see all the homes start right at 1 pm and drive between the homes — carpooling is a good alternative if you can find someone else who wants to take the tour. See you on October 25! Posted in Housing, Laneway House and tagged Laneway House, Vancouver Heritage Foundation Laneway House Tour. Bookmark the permalink.